Donations of items can be dropped off now through Friday, May 3. We kindly request no clothing, TVs, or other outdated technology, please. 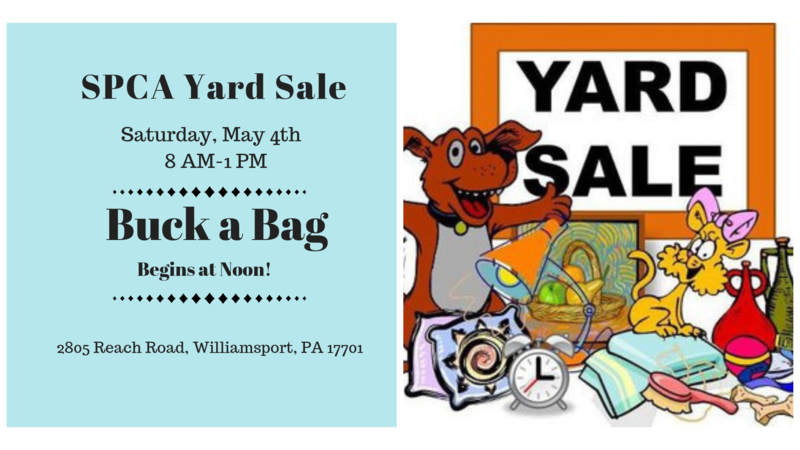 The event itself will begin at 8:00 a.m. on Saturday, May 4, and wrap up at 1:00 p.m. at the Lycoming County SPCA. Buck a Bag will begin at 12:00 p.m. Any sized bag welcome! There is always quite a selection of unique and useful items. We encourage you to come out and support your region’s only privately-funded, full-service shelter! Please note: the SPCA does not open for regular shelter business until 10:00 a.m., but the yard sale does begin at 8:00 a.m.